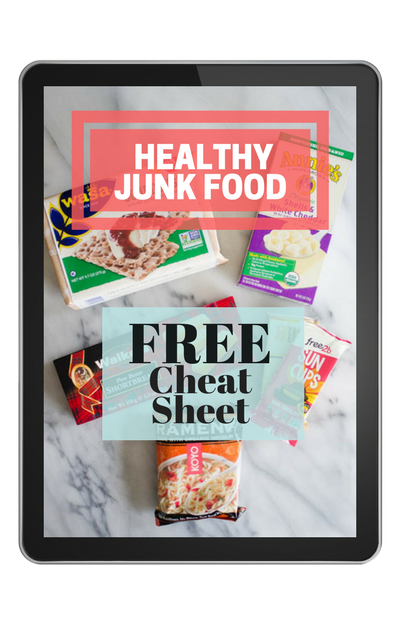 In my recent reader survey, y’all asked for more healthy main dish recipes. 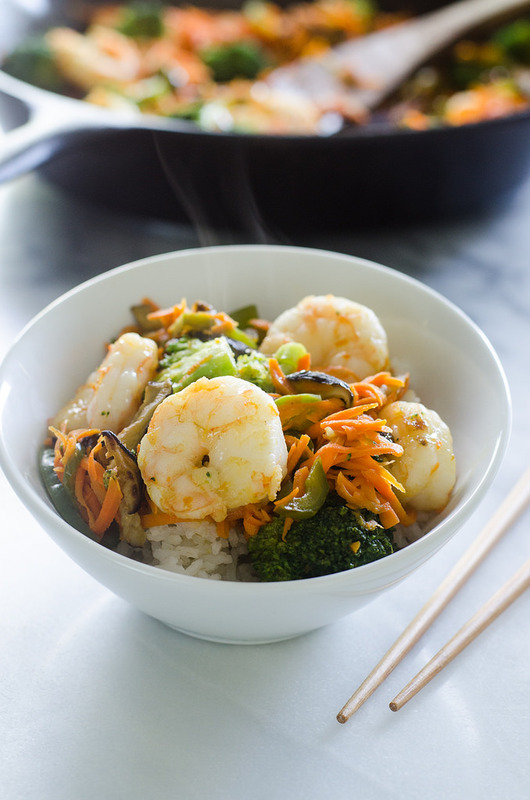 So I thought I’d show you one of my favorite quick-and-easy suppers: Shrimp Stir-Fry! I think all of us have at some point been strapped for time and scrambling for an idea for what to make for supper. Your husband and kids are staring at you because they were hungry YESTERDAY. You desperately want to call in some takeout, or pack everyone up and head to the nearest restaurant. 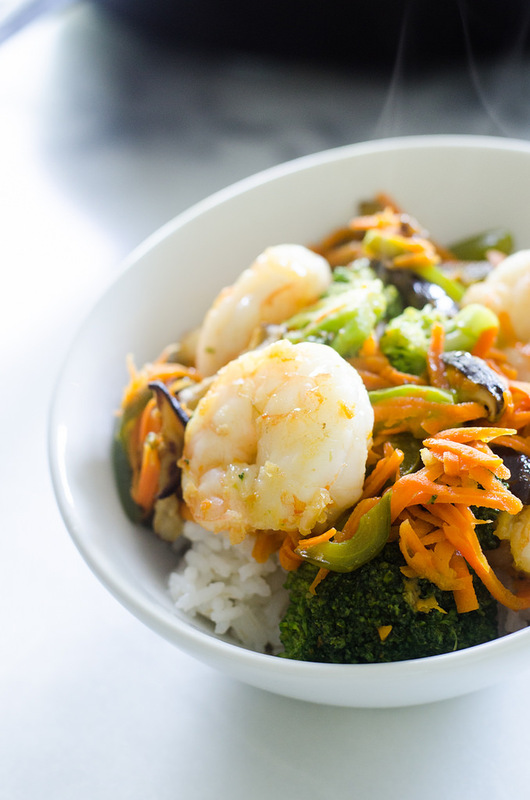 But in the time it takes for the delivery guy to make it to your house or for your food to arrive at the restaurant, you can have this healthy 30-minute stir fry on the table. I actually lied: this recipe only took me 26 minutes to complete from start to finish. I was working quickly, but I wasn’t going at breakneck speed. 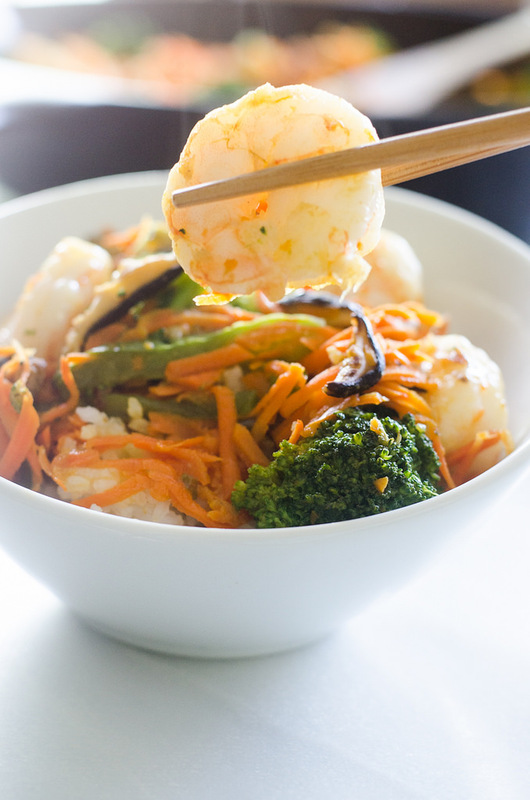 Shrimp are loaded with vitamins and minerals: Vitamin A, Vitamin B12, Niacin, Selenium, Iron, Phosphorous, Zinc, Copper, and more! Make sure to source wild shrimp when possible. 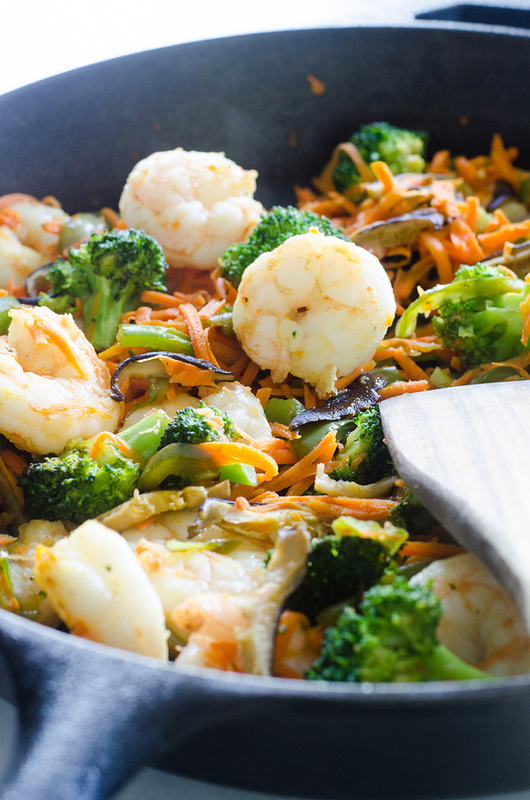 This recipe has 3 different kinds of veggies: broccoli, carrots, and green peppers! Shiitake mushrooms contain phosphorus, manganese, riboflavin, niacin, and more! Research also suggests that they help to fight cancer! Coconut aminos are a great soy-free alternative to soy sauce. HOW IS THIS RECIPE READY IN UNDER 30 MINUTES? Shrimp cooks super fast. In fact, there’s always the danger that you can over-cook it! I sliced the veggies thinly so they would soften quickly. I got my pan suuuuuper hot and stirred the veggies often. I cooked the veggies together instead of individually. This isn’t as pretty as when you clean the pan out after sauteing each ingredient separately, but it speeds up the cooking time. Swap out beef or chicken if you don’t have shrimp on hand. Thinly sliced steak cooks very quickly. 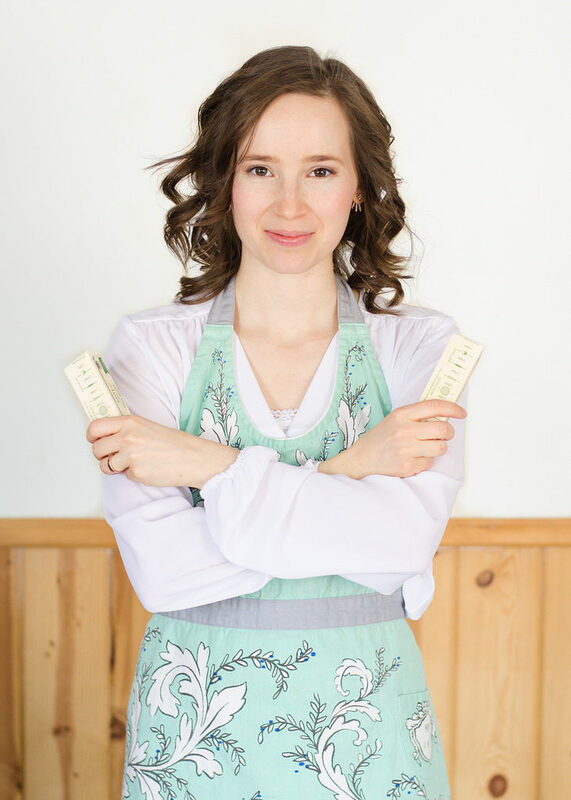 Use your favorite veggies in place of the ones I suggest, or do a “clean out the fridge” and use up whatever veggies are languishing in your crisper. Don’t care for shiitake mushrooms? You can definitely use baby bella or button mushrooms instead. If you like a bit of heat, add some hot sauce when you add the coconut aminos and ginger. Raw kimchi (you can actually find this at Walmart now!). 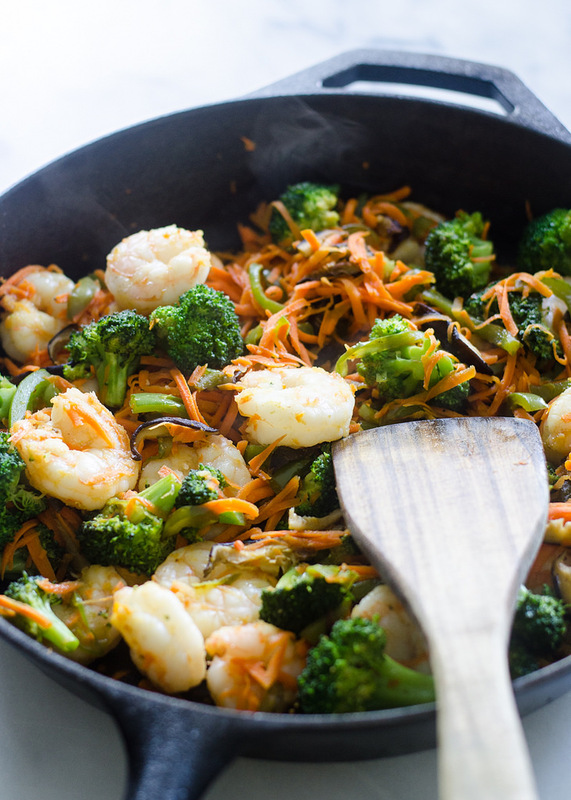 What are YOUR favorite stir-fry condiments? Begin by putting your rice on to cook, if using. Heat a large cast iron skillet over high heat. Add 1 tablespoon avocado oil. Add the mushrooms and cook, stirring occasionally, for 2 minutes. Add the peppers and broccoli and cook 5 minutes. 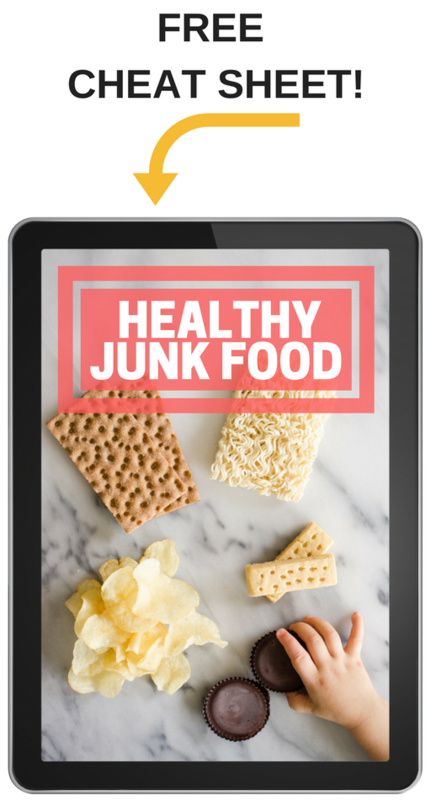 Add salt and pepper to taste, ginger, and coconut aminos. Add more oil to the pan, if needed. Add the shrimp and cook for 2 minutes. Flip the shrimp over and add the carrots and garlic. Cook until shrimp is done. Remove from heat and stir in the sesame oil. Taste and adjust seasoning if needed (add more salt and pepper, coconut aminos, etc.). 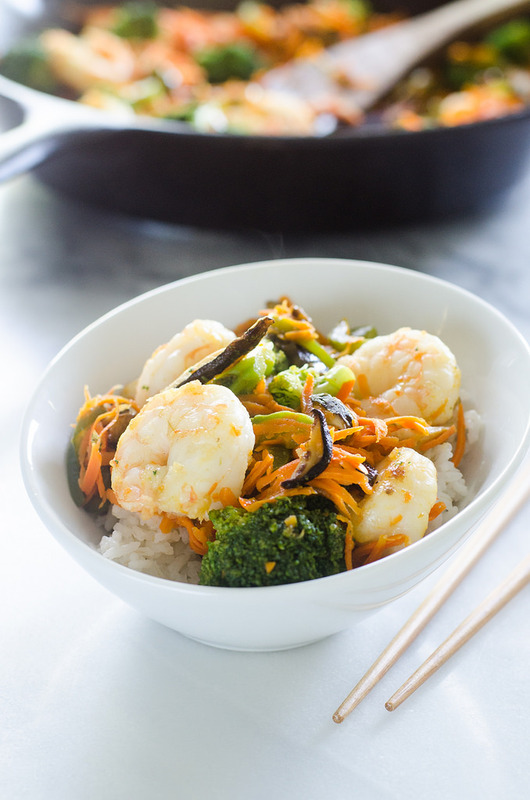 Serve over rice (if desired) with kimchi, pickled ginger, more coconut aminos, and sriracha. NOTE: Some links are affiliate. If you click on them, I will earn a small commission. All opinions, of course, are mine alone. Thank you for supporting Buttered Side Up! 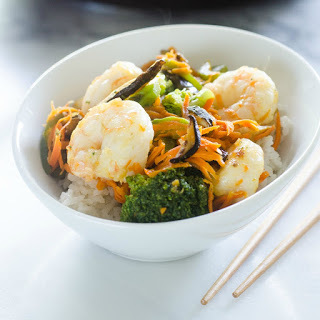 I love to keep frozen shrimp in the freezer, but it seems like a lot of what's out there is farm raised so I haven't found any good options in a while. Can you recommend a good brand of wild shrimp? I found the shrimp at my local health food store – they were quite expensive. You can purchase wild shrimp on Vital Choice online, though they are pre-cooked.